How can I help? give 1% to abolish slavery! Isaiah 29 - "God says: 'These people come near to me with their mouth and honor me with their lips, but their hearts are far from me.'" 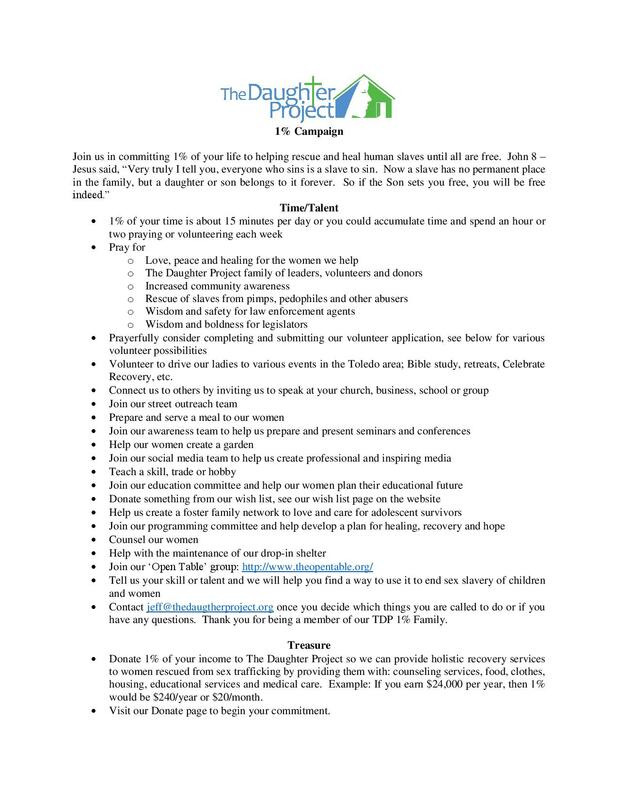 The Daughter Project 1% Campaign is our answer to your question: How can I help? However, the 1% Campaign is much more than a t-shirt slogan or bumper sticker. It is a profound, life-changing challenge for all of us. We can easily say we believe human slavery is a fundamental injustice but that is a useless platitude if we do not prove our belief with tangible expressions of love and support for those who are enslaved. Are you ready to live like you believe slavery is a heinous crime? Are you ready to love God by loving others? Then scroll down to learn more about our TDP 1% Campaign. Are you willing to devote 1% of your life to helping slaves? Do you love God enough to love the slaves in our community by donating 1% of your time, talent and treasure to help them? Click here for a printable list of practical ways to help. If you would like to be part of our 1% Community, please use this signup form to join. We will be sending periodic emails with stories from your fellow "one percenters." chronicling our journey as we give 1% of our time, talent, and treasure to abolish slavery. Our hope is that as you begin helping the women that The Daughter Project serves, your stories will help impact others to be part of abolition.